Asphalt shingles have a reputation for being durable, long lasting, cost-efficient, and easy to install. As a result, they are easily one of the most popular roofing materials on the market, especially for residential roofs. However, despite their popularity, there is some information you might not know. 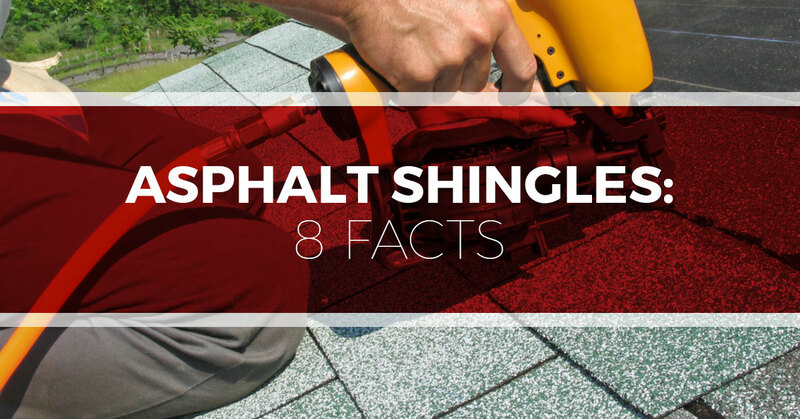 This is why we at Tim Leeper Roofing have put together this list of asphalt shingle facts. When it comes time to repair or replace your roof, contact Tim Leeper Roofing, Nashville’s Top Rated Local® Roofing Contractors. Most asphalt shingles are not made entirely of asphalt. They are typically comprised of either a fiberglass or an organic core and then covered with a waterproof asphalt coating. Organic cores are primarily made of paper and contain more asphalt than their fiberglass counterparts, making them heavier and also more expensive. Though they are known for being rugged and flexible, they can warp over time. Fiberglass-cored shingles, on the other hand, are thinner and lighter—because they require less asphalt to achieve a durable finish—and have a stronger resistance to fire, making them the more popular choice for homeowners and contractors. Shingles last longer with proper ventilation. When proper ventilation is not in place, not only will you damage your roof, but you will also lose your warranty. This is why you should contact experienced professionals to install your roof and ventilation. Though this might seem rather obvious, it’s a reminder worth mentioning. When you put new shingles on a home you significantly increase its value. If you’re thinking about selling your home, consider this an option to boost curb appeal and add to the asking price. Some sources claim a new roof can increase your asking price by up to $12,000. Typical roofing contractors provide several options when it comes to roofing. Strip shingles are the most common type. Laminated shingles are typically used when trying to focus on a specific design or visual goal. And though they are more expensive and time-consuming to install, individual shingles are easy to replace when damaged and can be customized to meet your roofing needs. At Tim Leeper Roofing we have a variety of asphalt shingle options to help you find the roof you want and need. Contact us to learn more! In years past, it was believed that asphalt shingles were among the least energy-efficient because they absorb heat, causing a rise in the temperature of your home. However, with a surge in environmental awareness and consumer demand, roofing manufacturers have been able to develop shingles that are able to reduce your roof’s temperature by nearly 20% during the peak summer months. These options are typically certified by the Energy Star Label. Once you decide to replace or repair your roof, the unwanted shingles can be removed, reprocessed, and turned into new roofing—or a new road. It is estimated that roughly one ton of recycled asphalt shingles saves the equivalent of one to two barrels of oil. That being said, it is also estimated that nearly 11 million tons of asphalt shingles are wasted each year. Dark colors absorb more heat than light colors. Naturally, this also applies to the color of your shingles. If you’re in a hot climate, it’s better to choose light colored shingles because they are less susceptible to the sun’s damaging effects. As opposed to dark colored shingles, lighter ones don’t absorb as much UV rays and heat, which lessens the likelihood of them becoming dry, brittle, and damaged—all of which are common problems for shingles in hot climates. If you are diligent with your maintenance, and routinely get inspections that help spot any minor issues before they grow into big issues, your asphalt-shingled roof can last a long time. Do keep in mind that this isn’t true for all asphalt roofs. The roofing companies in charge of the job are vital to determining how long a roof lasts, which is why it’s important to go with trusted, experienced roofing contractors. If you’re in the Nashville area, we got you covered. If you need to install, repair, or replace the asphalt shingles on your home, contact Tim Leeper Roofing—we are Nashville’s Top Rated Local Roofing Contractors.